Shagspeare (Max Tachis, left) reacts to Sir Robert Cecil (Brad Satterwhite). Sometimes lying is morally better than telling the truth. That’s one premise of Bill Cain’s “Equivocation,” presented by Dragon Theatre in Redwood City. This premise is postulated by a Jesuit priest, Father Henry Garnet. He’s accused of being in on the Gunpowder Plot, a 1605 conspiracy by several Catholics to amass about 36 barrels of gunpowder under Parliament and to set it off when King James I and others are there. They hope to take over England, where the king has criminalized Catholicism, but the plot was foiled. Cain fictionalizes this historical event by making it about a play that Shakespeare didn’t write. One of the king’s devious men, Sir Robert Cecil (Brad Satterwhite), commissions playwright William Shagspeare, or Shag (Max Tachis), to write a play about the conspiracy. Shag and his actor colleagues take the advance money, but they think Cecil’s outline is unworkable because it’s pure fiction. Nevertheless, Shag questions several conspirators and gains some unexpected insights, especially from Father Garnet (Paul Stout). Judith (Alika U. Spencer-Koknar) picks up after her father, William Shagspeare (Max Tachis). These insights allow him to come to terms with his grief over his son’s death and to make amends to his neglected daughter, Judith (Alika U. Spencer-Koknar). Tachis and Spencer-Koknar are the only actors who play just one character. The others -- Satterwhite, Stout, Paul Rosenfield and Michael Welland –- play all of the other characters, easily making speedy transitions. 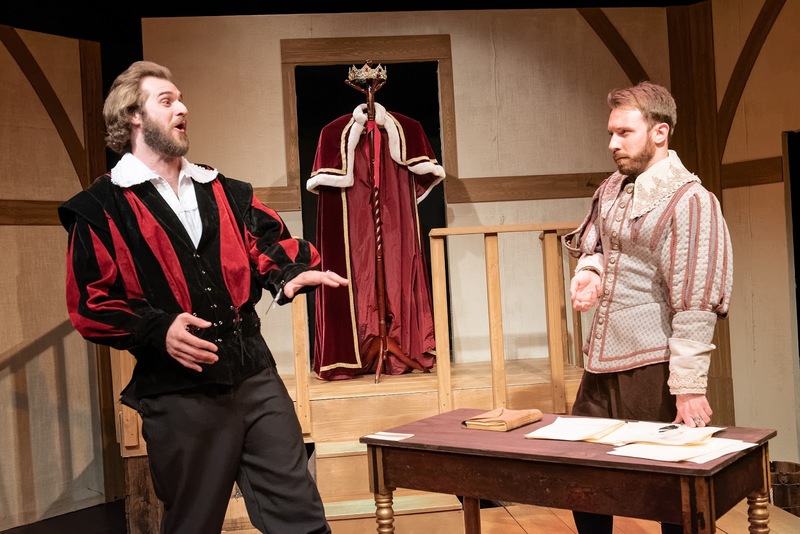 Although Shag couldn’t write a play about the Gunpowder Plot, he and his colleagues stage the Scottish play (“Macbeth), correctly reasoning that it would please King James I (Rosenfield), who was Scottish. Director Jenny Hollingworth allows some unnecessary yelling, especially by Rosenfield as Thomas Wintour in the “King Lear” scene, but he’s better as the king. Except for the yelling, the actors, especially Tachis and Satterwhite, do a good job with this intricate play. The simple set is by Seafus R. Chatmon-Smith, with lighting by Sean Kramer, costumes by Kathleen Qiu and sound by Jonathan Covey. 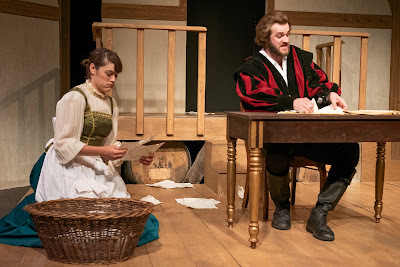 Running about two hours and 40 minutes with one intermission, “Equivocation” will continue through Aug. 19 at Dragon Theatre, 2120 Broadway St., Redwood City. For tickets and information, call (650) 493-2006, Ext. 2, or visit www.dragonproductions.net.